A couple of weekends ago, I took the boys downtown to Railroad Park while Grayson and Amelia napped. If it had been, oh, 30 degrees cooler outside, it would have been gorgeous. But it was over 90 degrees that day, so it was a scorcher. 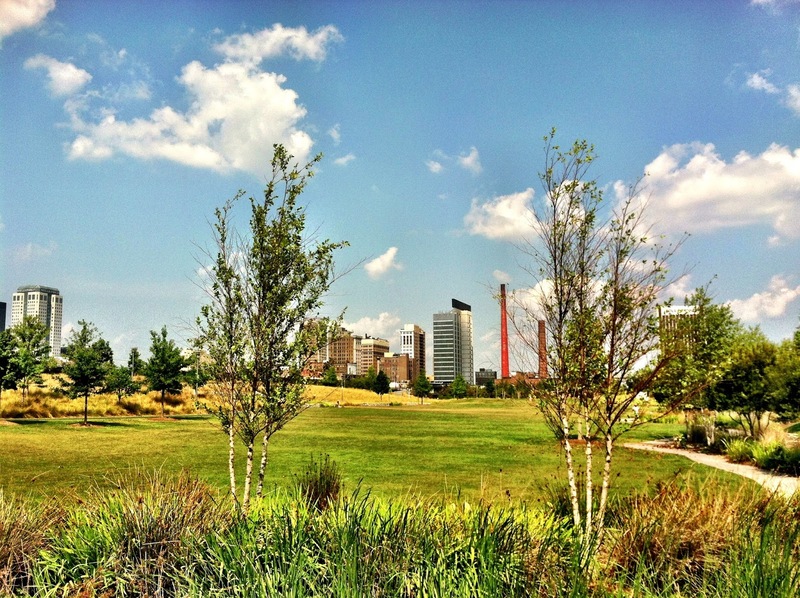 Still, Railroad Park is a really beautiful place. Jake wanted to be like me and wear sunglasses, so I found a pair in the van that -- while a little big -- fit him well enough for the day. CUTE. Nathaniel and Nick took their skateboards and helmets, but Jake chose a baseball and bat. This was the first time the boys had seen the new Barons baseball stadium up close since it was built over their beloved skate park this year. They may never forgive the Barons for that. Now the boys are left with rather tame paths on which to skateboard, rather than the plyboard-ramp deathtraps that used to be so much fun in the vacant lot across the street. The only other person we saw in any direction was a guy playing with his dog in one of the fields. But everything else was pretty much empty! We had it to ourselves, so we played, rode and ran around until the boys were thoroughly bored, and then I offered to take them over to Homewood Park before we headed home. They used to have an "official" skate park at Homewood Park, complete with lots of ramps and a smooth surface, but they took it out a year or two ago. Still, skaters come by and practice there, but it's not the same. We ran into a guy named Geoff there, and he was doing lots of neat tricks. He said he'd be happy to show Nick a few things. Geoff worked with Nick for about an hour while Nathaniel and Jake played on the playground, and Nick was VERY impressed with Geoff's skill level. Nick even learned a thing or two! Geoff gave us his number and said we should call him anytime we're going to be at the park on a Saturday because he'd be happy to coach Nick a little. So now if he wants a lesson on a Saturday, all we have to do is look up the guy in my phone who's listed as "Geoff Skateboard."